We had a family hike at San Pedro Valley Park on MLK Jr. Day. Saw quite a few groups on the trail, each one clutching a trail map, so it looks like folks are exploring new places -- hooray for that! 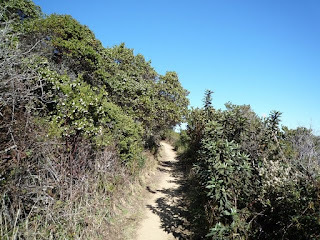 I've certainly never hiked at San Pedro in January and experienced such dry, even dusty trails. The manzanitas were blooming as normal for this time of the year, but we didn't see any annual wildflowers budding or in bloom. Thanks for the recommendation! After a rainstorm to get the falls flowing we found the Donner Canyon Falls Trail at Mount Diablo to be a really great hike.